Second Lieutenant "C" Coy. 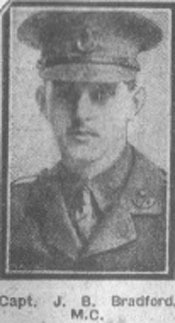 18th Bn., Durham Light Infantry who died of wounds, aged 27 on Monday, 14th May 1917. Second Lieutenant BRADFORD was the son of Mrs. Bradford, of Milbanke, Ravenlea Rd., Folkestone, and the late George Bradford; husband of Annie Bradford. Remembered with honour DUISANS BRITISH CEMETERY, ETRUN, Pas de Calais, France. James was educated at Darlington Grammar School (now Queen Elizabeth Sixth Form College) and at Polam Grange School in Darlington. Although it has been said of him that "he was not clever, but a plodder", he did have one gift which had not been given to his brothers; he and his sister were both very musical. Over six feet in height and strong and wiry, James took part in nearly every branch of sport with true Bradford zest; indeed his physique was one that any athlete might have envied. A fair cricketer and soccer player, he was also a good boxer, wrestler and swimmer. With his most generous disposition and simple faith in the honesty of all the world James Bradford was a man for whom it was impossible not to feel a warm affection. His sympathetic outlook on life, and his quickness to see points of view other than his own, made him exceptionally successful in handling men. After leaving school he served his time at Hawthorn Leslie's Engineering Works at Newcastle-upon -Tyne as an Engineer, and later became a Director of the Dinsdale Wire and Steel Works, Co. Durham. For three years before the war he was in the Naval Reserve as an Able Seaman, and in 1913 he became a trooper in the Northumberland Hussars. In 1914 he went out with them to France. Some years later....James Bradford's photograph was on the front page of one of the Newspapers. As a trooper in the Northumberland Hussars James was perfectly contented and happy. He had never been an officer, and he had no ambition to become one. Consequently a lot of persuasion and argument was required before he could be induced to change his mind. In 1915 however, he yielded to the persuasions of his brother Roland, who told him that he would be of more value as an officer. Soon afterwards he was given a Commission in the 18th Battalion, the Durham Light Infantry (Kitchener's Army). During the summer of 1916 James married Miss Annie (Nancy)Wall of Darlington, who went to the same school as his young sister Amy. They had no children, which is sad. But perhaps it was for the best; how can we know about such things? 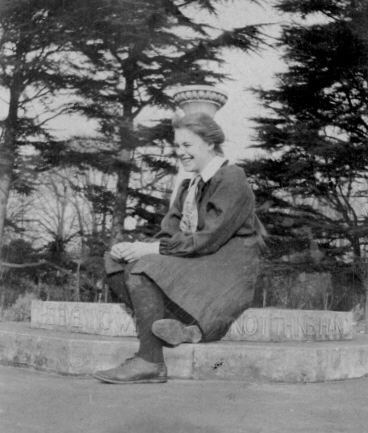 This photo of Jimmie's wife Nancy was taken in 1911 while she was at Wycombe Abbey School, to which Amy Bradford was to go three years later in 1914. Temp. 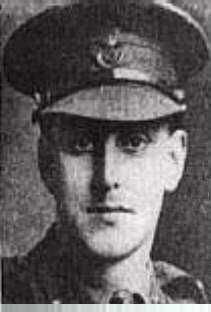 2nd Lieutenant James Barker Bradford, 18th Bn. Durham Light Infantry. For conspicuous gallantry and devotion to duty. He gallantly led his men into the enemy's trench, capturing many prisoners and two machine guns. He himself killed three of the enemy. Later he succeeded in repelling a determined enemy counter attack. Hebuterne Sector, 3rd March, 1917. 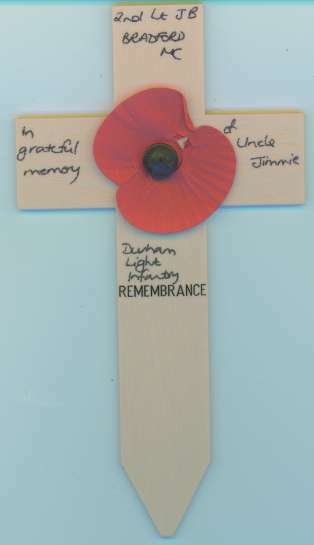 During that month of March, his brother George in the Navy had expressed his hopes that 'a grateful country would give Jimmy a decoration.' And in the light of future events it is more than pleasing to think of George's gratification in the fact that his brother's gallantry was so quickly recognised. On the 10th May 1917 James was wounded again. 'G.S.W. left shoulder and left thigh,' and from these wounds he died four days later. 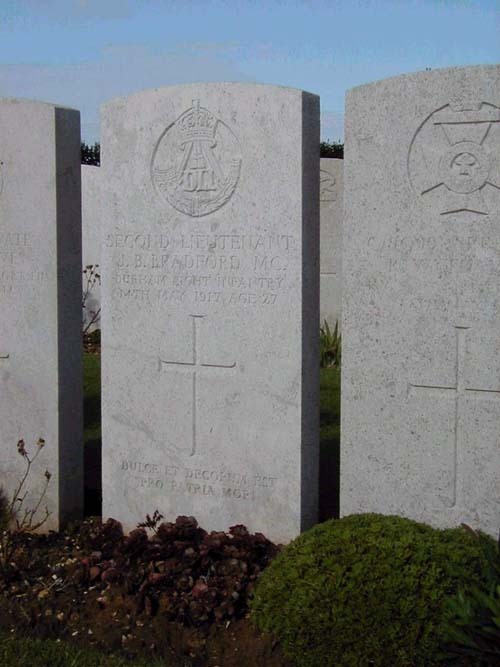 He was buried in Duisan's British Cemetery, near Arras, France, the first of the Bradford brothers to lay down his life for a cause in which he steadfastly believed and for a country he dearly loved. The medals of James Barker Bradford, M.C. 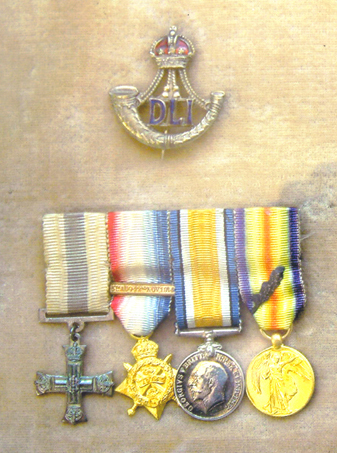 - Durham Light Infantry - which are in the medal collection at the D.L.I. Museum. Cemetery: DUISANS BRITISH CEMETERY, ETRUN, Pas de Calais, FranceGrave Reference/ Panel Number: IV. G. 33. Location: Duisans and Etrun are villages in the Department of the Pas-de-Calais, about 9 kilometres west of Arras. The Cemetery lies in Etrun but takes its name from the nearer village of Duisans. It is one kilometre north of Duisans on the D339 road off the Route nationale N39 (Arras-St Pol), in the angle of the Arras Habarcq road and a track leading to Haute-Avesnes. 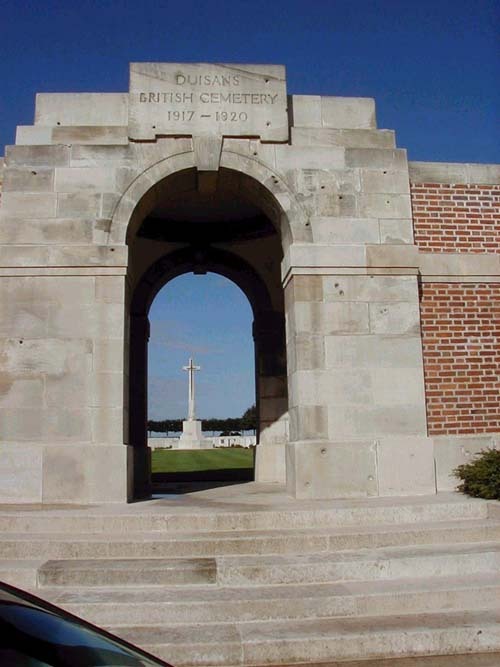 Duisans and the neighbourhood came under British occupation in March, 1916, but it was not until February, 1917, that the site of this Cemetery was selected for the 8th Casualty Clearing Station. 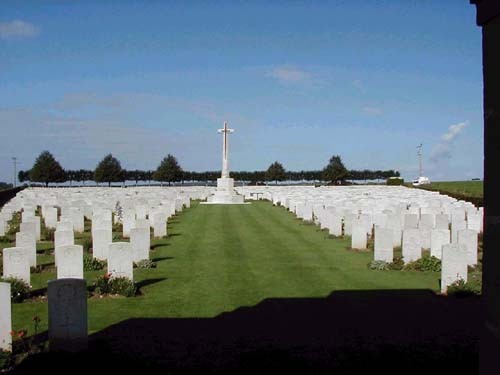 The first burials took place in March; and from the beginning of April the Cemetery grew very quickly under the pressure of casualties in the 8th Casualty Clearing Station (until April, 1918), the 19th (until March, 1918), and the 41st (until July, 1917). The Battles of Arras, 1917, and the subsequent trench warfare are the historical background to these graves. From May to August, 1918, the Cemetery was used by Divisions and smaller fighting units for burials from the front line. In the Autumn of 1918 the 23rd, 1st Canadian and 4th Canadian Clearing Stations remained at Duisans for two months, and the 7th was there from November, 1920. 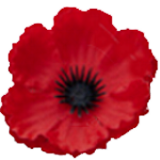 There are now over 3,000, 1914-18 war casualties commemorated in this site. 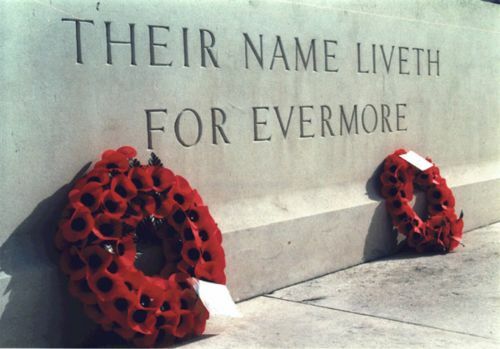 Two British graves were obliterated by shell fire, and the names are recorded on special memorials. In Plot II, Row A, there are buried, side by side, two brothers, an Officer and a Private, who died of wounds at Duisans on the same day.